In addition to routine brushing and flossing, there are other steps you can take to keep your teeth from becoming stained or discolored. Certain foods and beverages have the ability to affect the whiteness of your teeth due to their color and acid content. Avoiding these foods and beverages can help you to maintain a whiter smile. Beverages such as coffee, tea, colas, red wine and fruit juices have dark colors that can stain your teeth. Some of these choices also have high sugar and acid contents that may weaken the surface enamel of teeth, resulting in a greater risk of stains. Certain foods can also stain the teeth. Fruits and vegetables with dark colors, such as berries, grapes, cherries, tomatoes, and beets, can leave behind residual color, resulting in discoloration and staining. Certain flavoring agents and sauces, such as curries, soy sauce, and tomato sauce, may also affect the whiteness of the teeth. Candies and sweets are major culprits that affect the teeth. Hard candies, popsicles, sugary gum, and other sugary or sticky treats can cause yellowing and staining of the teeth. When considering food and beverage choices, just remember that if it can stain your clothes, lips, or tongue, then it has the potential to stain your teeth. To keep your smile as bright as possible, see our cosmetic dentist in West Hollywood for twice a year exams and cleanings. 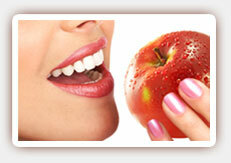 Our dentist can also make recommendations on how you can get or keep your teeth white and sparkling.